Head off on a treasure hunt on a family-friendly trail along the river and into the forest. Starting from the Tourist Office, cross the bridge behind the Catholic church and the first station is on your left at the end of the bridge. Then head left along the river towards the Eurotel Victoria. The trail continues behind the hotel to the Domaine des Sources, where you’ll find the second station at the entrance. Continue along the river to the crossing point, then take the right-hand path. Further on, you get to a clearing where you’ll find the third station. Then follow the road, turn left, cross the bridge and take the path on your right that heads into the forest. When you come out of the forest, cross the bridge on the right and you get to a car park where you’ll find the 4th station. Take the road heading left then the path that continues into the forest and along the river to the Léderrey footbridge. The 5th station is at the start of the footbridge. When you’ve crossed the bridge, continue your walk to the right along the exercise trail. The 6th station is by the parallel bars. Cross the road and continue into the forest on the woodchip path to the next exercise where the 7th station is located. The 8th station is a bit further along the path by the big rock. Then the 9th station is by the slalom exercise further along the exercise trail. When you come out of the forest at Le Droutzay, the 10th station is near the fountain. Then head along the Route d'Aigue Noire to the next fountain where you’ll find the 11th station. The 12th station is further along the Route d'Aigue Noire where it crosses the path that heads left into the forest. Continue into the forest until you get to the Pont d'Aigue Noire. The 13th station is at the end of the bridge. 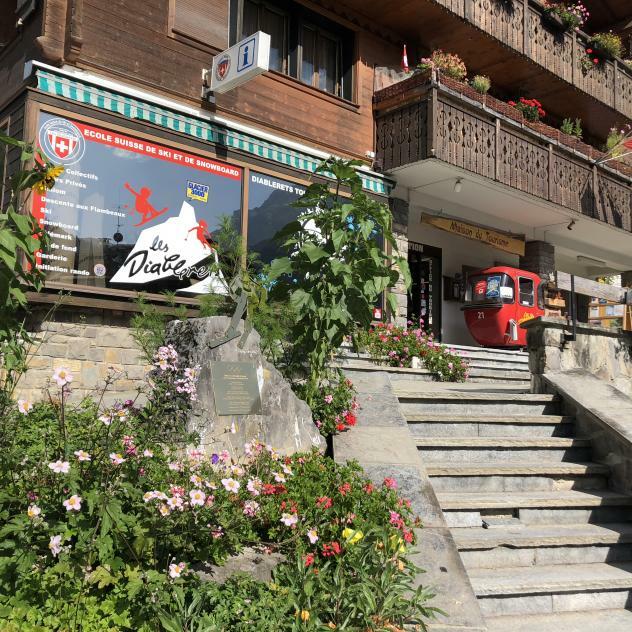 Then return to Les Diablerets and post your answers in the box at the Tourist Office.